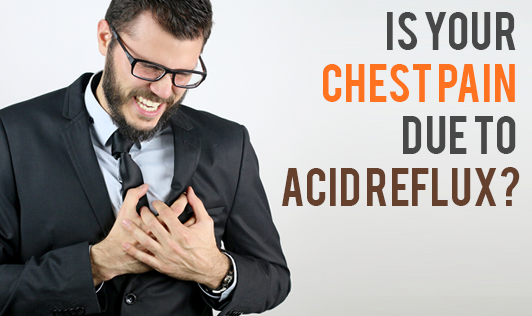 Is your Chest Pain Due to Acid Reflux? It can be difficult or even impossible to tell what is causing chest pain. It is also difficult to distinguish between cardiac and esophageal causes of chest pain based upon symptoms, as the nerves that supply the heart supply the esophagus as well. In order to determine if a person is experiencing acid reflux chest pain, physicians conduct certain tests to measure acid levels in the esophagus, the tube that carries food from the mouth to the stomach. It is important that you should not assume the chest pain is caused by GERD until you have been thoroughly evaluated by a physician to rule out any heart disease. So, a medical emergency is important for proper diagnosis and prompt treatment.